The Early Bird cut-off date is one month PRIOR to the scheduled training date. Last minute goes into effect when registering 7 days or less before the training date. Please contact customer service with any questions. Learn ways to adapt the principles of yoga’s sister science, Ayurveda, to your yoga classes and for your clients in this two-­day intensive. By taking into account health challenges, age, seasons of the year, times of day, and myriad other factors, Ayurveda can help you more effectively meet the needs of your students, your clients (and yourself) on and off the mat. Combines lecture, discussion and practice. Note: This course fulfills part of the requirements for the YogaFit 100-hour Ayurvedic Coaching Certificate as well as the YogaFit Healthcare 900-hour teacher training certificate. Please read our Terms and Conditions prior to registering for a training. What is YogaFit® and how is it different than "traditional yoga?" Most health clubrooms are cold and air-conditioned – The YogaFit® style heats the body sufficiently through its heat-building flow, which then creates a safer, more effective environment for the participants. This gradual heat-building helps reduce incidence of injury. In a health club setting, there is a constant flow of new people mixed with regular students. The YogaFit® style allows the instructor to challenge the more seasoned students while creating a safe, accessible workout for the newer students at the same time. Are certain yoga poses contradictory to general Exercise guidelines? The practice of yoga has been around for 6000 years, which is much longer than aerobics. Therefore, we wouldn’t expect yoga to fit neatly into the aerobic guidelines. If we look closely, though, we see that the practice of yoga contains the five components of fitness: Cardiovascular endurance, flexibility, muscular strength, muscular endurance and body composition. If a student finds that he/she is uncomfortable with any pose, there are always options or variations of that pose to consider. Inversions can always be taught with the option of legs up the wall pose. The Special Conditions section of the Level 1 manual contains more specific information for different populations of students. How do I receive my Level 1 certificate? Upon completion of the initial Level 1 training, trainees are required to teach 8 hours of community service classes to a group of people that are not currently being served by the Yoga community; i.e. seniors, children, people with disabilities, cancer patients, those living in homeless shelters, corporate executives, etc. 2) a personal letter detailing the community service experience. How can I use the name YogaFit® for my club's classes? Currently, YogaFit® Studios are the only ones licensed to use the name YogaFit®. You can advertise yourself as a yoga instructor who has trained with YogaFit® but unfortunately you cannot use the YogaFit® name in any other way, as it is trademarked. That means, you're not able to advertise your classes as YogaFit® classes. 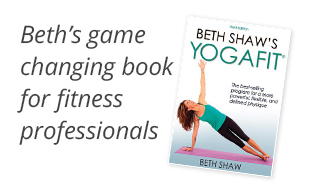 How do I become a trainer for YogaFit®? Must have RYT 200 through YogaFit® Training Systems. Must have a minimum of 5 years of vinyasa yoga teaching experience. Must reside within 1 hour from a major metropolitan airport. Must have a national fitness certification through American Council on Exercise (ACE), OR plan to obtain one if accepted into the program and moved into the Paid Assist category. We do accept CanFitPro for our candidates from Canada. I teach seniors...how can I modify the practice? Begin by focusing on breath work. Remember that our Senior population needs to focus on functional movement - getting up and down, bending safely, maintaining joint mobility, balance, etc. We also want to incorporate chest openers, as osteoporosis has begun to affect many of our seniors. We want to keep them as mobile as possible for as long as possible. Using a chair for support or balance is always a nice option, as well. We always want to bring our Seniors’ classes back to functional, restorative movements. Why should I not do inversions on my menstrual cycle? There is a widely held belief that practicing inversions during the menstrual cycle can lead to endometriosis. While there is no medical evidence to support this belief, we do believe in safe yoga and erring on the side of caution. We advise that anyone who feels any discomfort during inversions while menstruating should abstain from practicing those poses during their cycle. Do you offer canfitpro continuing education credits (CEC's)? We DO offer canfitpro CEC’s. We are partners with canfitpro and offer 10% off any training to canfitpro members. Please call 855-607-9742 to register and take advantage of this discount. Does ACE offer a special discount for their test materials for YogaFit trainees? ACE stands for American Council on Exercise. ACE is an education company who certifies individuals to become personal trainers, group exercise instructors, lifestyle weight management, and clinical exercise specialist. *You do not have to be ACE certified to attend YogaFit trainings. Do you offer AFAA CEC's (continuing education credits)? We don't provide AFAA CEC's. Those who would like to receive AFAA credits for our trainings will need to petition with AFAA. Will I be a "certified" yoga instructor after attending the Level 1 training? After you attend the Level 1 training and complete the community service requirement you will receive a certificate of completion. You can then say that you are Level 1 - trained by YogaFit. There really is no such thing as “certification” for yoga teachers. However, there is a “registration” option that provides proof of a minimum standard (RYT designation provided by Yoga Alliance). How long do I have to complete the 8 hours of required community service? You have 12 months to complete the 8 hours and provide proof. In the meantime you are welcome to register and participate in the next level of training. What are the prerequisites for the YogaFit for Warriors Program? There are no prerequisites, but Level 1 is highly recommended. What should I expect when completing the YogaFit for Warriors Program? Warriors workshops focus on not only PTSD and the military but on how and why trauma gets stored in the body which is applicable to all of us! The training relies on our trainees life experiences to help bring the theories/ideas to life. We then use our own personal somatic "stories" as launching pads out of our own traumas into new stories that are more aligned with our true path. Trainees can expect to have fun, to share and most importantly, to experience how to release trauma. Through that experience of trauma release, they will then be better able to help other release their stories. Trainees can expect some large group discussion., 2-hour yoga master classes, small group work, meditations, asana (poses) break-down, pranayama and imagery techniques to help resolve PTSD and trauma. Who should I contact for more information regarding the YogaFit for Warriors Program? What is the mission on the YogaFit Healthcare Program? YogaFit® Healthcare Program will provide students with a unique and comprehensive education as it relates to the profession of yoga therapy. The YogaFit® Healthcare staff and entire team are committed to educational components that encompass a didactic, clinical and field educational experiences that prepare YogaFit® students as an entry level professional. Field experience opportunities are sought out within the students community and advised/mentors by YogaFit® Healtcare staff. The YogaFit® Healthcare student will have the opportunity to develop and master competency knowledge and proficiency skills as defined by the International Association of Yoga Therapy Competencies. The YogaFit® Healthcare Program draws from the authentic traditions of yoga, in addition to recognized medicinal protocols and practices to adhere to the standards of the Yoga Therapy Professions. Our program has been developed to meet the standards of the International Associ- ation of Yoga Therapy (IAYT) and, with equal importance, meet the needs of yoga teachers wishing to extend their scope of practice to become Yoga Therapists. The YogaFit® Healthcare Training Program involves residential modules, non-residential modules, studying abroad, electronic learning, conference calls, self-directed study, and practicum hours. What are the prerequisites for the YogaFit Healthcare Program? What trainings are offered as part of the YogaFit Healthcare Program? Who should I contact with questions regarding the YogaFit Healthcare Program? What should I expect at a MBF Conference? MBF's are 4 days of trainings held in large cities all over Canada and the US. Each day begins with a complimentary Master Class, led by one of our dynamic YogaFit Trainers. Trainings run from 8 am to 6 pm Thursday through Saturday and from 7 am to 5 pm on Sundays. Save your energy, because the fun continues each evening with different educational workshops. In the past, these sessions have included Essential Oils, Introduction to Thai Massage, Chakra Dance Party and more. Each conference offers a variety of trainings for those attendees just starting out on their 200hr path through trainings for our 900hr YogaFit Healthcare Program. YogaFit highly recommends attending Level 4 at a conference so that you can fully immerse yourself in this life-changing 4 days of learning and experiencing. Our MBF's offer an opportunity to interact with our YogaFit Trainers, as well as members of our corporate staff. Last, but not least, we have a merchandise boutique open throughout each conference, where you can pick up the latest music, books, clothes, etc. Don't wait...register for an MBF today! Which province do I select when registering? As you may have noticed, only Canadian provinces appear when registering for a training. Feel free to select any province as this will not affect payment or registration. You must select a province from the list in order to complete registration. How do I request a certificate? Please see program pages for required trainings and how to register. Email requirements and copies of certificates to info@yogafitaustralia.com. Can I request a training in my area? Yes! Email info@yogafitaustralia.com with any training requests. Please note that in order for us to book a training there must be a minimum of 15 people interested in completing the training. based on your profile location.